Feigenbaum Diagram with Bifurcations, realms of deterministic behavior and apparent chaotic realm. 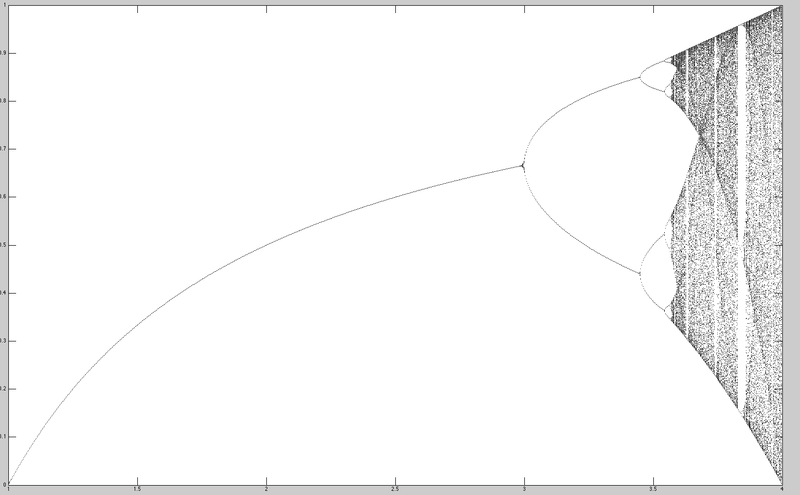 Ahh, 64 bit, maybe more RAM for plotting diagrams, like the one at left. That facilitating text-handling technology so popular on Apple’s iPhone will likely end up in the Apple’s new Macs as part of OS X 10.6 Snow Leopard. Screenshots rumored that a version of the TextEdit app to extend preferences for possibly three unique text handling utilities. The First corrects spelling automatically as the user types. The features hopefully will extend to all applications running on Snow Leopard. The are inevitable on all OSs as they are obvious usability enhancers. We will watch the mobile computing world converge with the traditional desktop / laptop world. This is inevitable. Microsoft will also copy this plan although they will take forever and it will be horrible whatever it is. As a MatLab user the RAM constraints that should be enhanced will allow even deeper probes from a single machine such as renderings of recursive Feigenbaum diagrams! Yeah! !